Finding your life’s passion in your early twenties sounds like a dream, but for Trevor Hayes that is his reality. Hayes is a senior at Penn State majoring in telecommunications. He is the visual manager for Onward State and lead photographer for Penn State’s spring concert Movin’ On. Hayes’ passion for the media industry developed when he attended high school. He studied videography and received his A.S. of Digital Media/Film Studies at Raritan Valley Community College in New Jersey before attending Penn State. 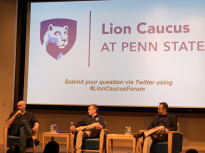 Hayes joined Penn State’s Onward State staff for videography, but was also given various opportunities to photograph different events and news related topics on campus. Hayes found he had a knack for photography and slowly drifted from videography. As he practiced more and more, he found himself improving his skills, finding his style, and loving every second of it. Hayes has a pre-shooting ritual where he closes his eyes, puts his camera to his face, and feels out the energy of his surroundings. This is his way of getting into the zone before taking his photos. Hayes’ last event he will cover at Penn State will be at Movin’ On, which is a student lead concert at Penn State held in April. Hayes’ face lit up with excitement when talking about this opportunity because Logic, Movin’ On’s headliner performer, is Hayes’s favorite artist. Hayes stated that he knows photographing Logic will be one of his best sets yet due to his excitement and love for the artist. Hayes is pursuing photography upon graduating this upcoming May and has been working on completing his portfolio for potential jobs opportunities. 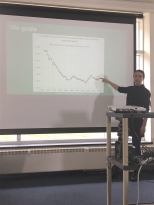 Hayes’ has come a long way in the photography business at Penn State, especially considering he started solely focusing on his photography abilities just a year ago. If you would like to get in contact with Hayes, he can be reached via email: trevor@onwardstate.com. You can also check out his work on his Instagram @tshaye22. Rebecca Mitrione is a Pennsylvania State University undergraduate scholar, who is studying a broad spectrum of subjects. She is majoring in public relations, while also minoring in entrepreneurship, business liberal arts, and international studies due to her passion for learning and drive for being competitive in her future field. Rebecca is a part of the College of Communication’s Multicultural Community and was awarded ‘The Bunton-Waller Fellows’ (Ethnic Diversity Merit Scholarship) when coming into Penn State. Rebecca has had many internship and leadership positions throughout her college career. Rebecca’s first public relations internship was with Ruby Media Group during her sophomore year at Penn State. She was also a leader in her THON organization by holding the position of the Alternative Fundraising Chair within her sorority. In the summer of 2016, Rebecca interned at the Cannes Film Festival in Cannes, France, which spiked her interesting in the film and entertainment industry. After the festival, Rebecca received a job from the health and wellness company Bulletproof, where she focused on marketing the brand and its many products. In the summer of 2017, Rebecca interned for The Velocity Effect where she gained more PR, graphic design, and social media experience. Rebecca has a passion for communications and is looking for a full-time job public relations job upon graduating Penn State in the spring of 2018. Along with the communications side of public relations, Rebecca enjoys graphic design, videography, and working on various media-related projects.